Thursday, Oct. 4, 12:30 p.m.: Is George Zimmerman suing NBC over tape editing? Trayvon Martin's shooter, George Zimmerman, is considering suing NBC News over a misleading edit of Zimmerman's call to 911 before the shooting, the Orlando Sentinel reports. The network's editing of the tape made it appear that Zimmerman volunteered that Trayvon was black, when, in fact, he provided the Florida teenager's race only when asked by the dispatcher. According to the Sentinel, Mark O'Mara said in a statement released yesterday that the repeated broadcast of Zimmerman's edited call to a Sanford Police nonemergency line in March was "outrageous." Wednesday, Oct. 3, 11:11 a.m.: Sanford Police Department gets reaccredited: The Sanford Police Department announced Tuesday that the Commission for Florida Law Enforcement Accreditation unanimously voted to reaccredit the agency, which of course came under fire for its initial handling of Trayvon Martin's fatal shooting by neighborhood-watch volunteer George Zimmerman last February. Read more at the Orlando Sentinel. Tuesday, Oct. 2, 11:43 a.m. EDT: From the photographer who took the widely used photo of Trayvon Martin in his football uniform to those who sold hoodies and gun-range targets to a man who registered domain names hoping that someone would fork over $25,000 for trayvondmartinfund.com, the Miami Herald takes a look today at who cashed in on the tragedy and how they justified it. 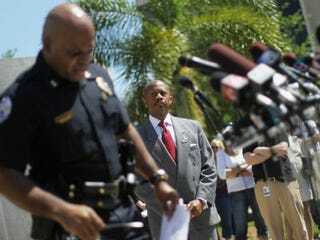 Monday, Oct. 1, 10:57 a.m. EDT: Martin-family attorney says race is "the elephant in the room": Asked by the Orlando Sentinel whether Trayvon Martin's shooting death at the hands of George Zimmerman and the resulting second-degree-murder trial constitutes a "story about race," Martin-family attorney Benjamin Crump said, "It shouldn't be about race. But race is the elephant in the room. Nobody believes that if you make Trayvon Martin white [and the neighborhood-watch volunteer black], there's no way he would not be arrested, and that's the unfortunate and tragic truth of the matter. There is a double standard. That's why race is involved in this case."